Sisters Lydia and Marnie Clarke give cheese a whole new accent. 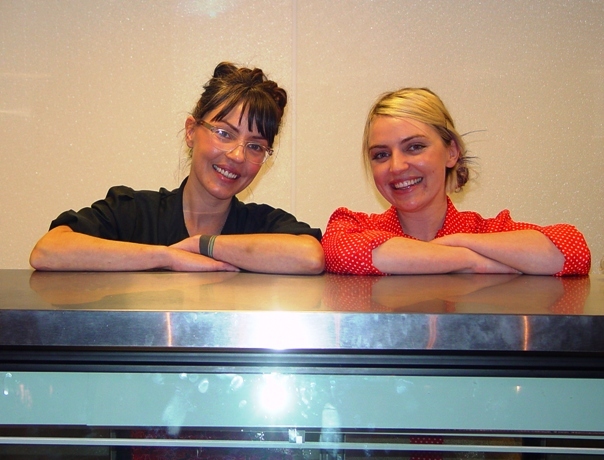 Wisconsin may boast the Cheeseheads, but California has the Cheese Girls, two La Verne, Calif. sisters, Lydia and Marnie Clarke, who opened the Cheese Cave this past June in the heart of the Claremont village. Lydia, 33, and Marnie, 26, are actually part of dairy royalty. Their grandfather was one of the founders of the Altadena Dairy, and, their father, Boyd Clarke, was the company’s longtime vice president and general manager before it was sold. While most girls on their 16th birthday get a driver’s license, Lydia got Bossy the cow, a larger-than-life platinum-colored cow that now sits in their cheese shop on Yale Street. (Perhaps, that was reason enough to open the shop, to get Bossy out of the house.) At home, while their friends snacked on Yoplait, they made their own yogurt, grew their own vegetables and ground their own beef. “So, making artisanal cheeses and handcrafted cheeses made sense,” noted Lydia. Lydia, who wears translucent frames highlighting her blue eyes, went to school to study design and worked for the Museum of Modern Art (MOMA) in New York City. She lived in France and before opening the cheese store was helping a friend run a hotel for dogs called Ruff in Napa, Calif. Their brother is Noah Clarke, now 31, the first native born Southern California to score a goal for the Los Angeles Kings. Meanwhile, Marnie began studying cheese and cheese-making after their father passed away four years ago. Don't tell anyone, but a customer built a little step stool so Lydia and Marnie can rise above the cheese counter to serve fromageofiles. “After my father passed away, I became really obsessed about all the stuff my grandfather and father saved on cultured dairy products,” Marnie said. “That’s when I started making cheese. On another day, she took a tour of the Winchester Cheese Company on the appropriately named Holland Road in Winchester near Temecula and Hemet and struck up a conversation with the owner who happened to know her grandfather. The small company known for its delicious gold-medal Gouda and for being California’s southernmost cheese maker hired her as an apprentice. Like a good cheese, all the ingredients for starting a family business were in place. Just a little more aging was needed, and that one spark to ignite the process. Actually, there were at least two. Marnie’s boyfriend, Milano, had challenged her to ask Winchester for a job, knowing that she really wanted to be a cheese-maker, and Lydia and Marnie’s mother had always been supportive of all of her children’s dreams. That’s how she happened to raise a cheese-maker, a museum designer and doggie hotel helper, and a professional hockey player. At some point dreams need structure. Despite a seven years’ difference in age, the sisters always knew they’d like to go into business together. Having moved back home to live with their mother in La Verne, there was plenty of time to discuss opening a cheese store. They finally secured a lease last December, and from that point forward until their June 18 opening, they retrofitted their shop with plumbing and a false ceiling, a cheese case and Bossy the cow. The found many items at Habitat for Humanity Re-Stores in Montclair and Azusa. A close friend, Felix, who goes to their mother’s church, did much of the woodwork. If you look up toward the ceiling, you see Bible inscriptions in the rafters, so this new house of cheese is already a holy and blessed place. The Claremont Village, surrounded as it is by the prestigious Claremont colleges, has always featured eclectic offerings, including independent bakeries, record stores, chocolatiers, wine and wood-fired pizza, but no cheese. That all changed when the cheese girls opened their shop. It was as if they tapped a rich, savory vein of bleu cheese. The college town was hungry for it. Harvey Mudd, the brainiest of the Claremont colleges, already has formed a cheese club, where its members discuss not only cheese but the great ideas of science. Another Cal Poly professor has begun holding “conversations” there once a month where “great ideas” are discussed. Cheese has that kind of influence over people. The sisters have seen its effects close up. “It creates community and conversation,” Marnie added. Serving up another slice of nice. The almost 150 varieties of cheese that the Cheese Cave offers is enough to start any conversation that Lydia, Marnie, Milano, Mariah, Sean and their mother Donna are only too happy to engage in. They willingly share cheese samples until the customer finds precisely the right one for the perfect picnic, dinner party or snack to nosh on between class. It’s not all smooth, creamy sailing, however. Despite their torrid love affair with cheese, they still have to run it as a business. The cheesy proprietors are well aware that a popular cheese store in Orange, Calif., another college town, recently closed. Still, they hope their knowledge, experience and genuine passion for the art of cheese-making will be the curd that separates them from the whey of other businesses. They want to become more adventurous right along with their customers. “It’s kind of fun to be able to show and lead them through this whole excursion of flavor,” Marnie said, her eyes and voice glowing as if she were the female patron saint of cheese. Besides cheese, the Cheese Cave offers delicious sandwiches, rubs, spices, beers, wines, baguettes and other fare by the pound, by the ounce or by the slice. The sisters are totally accommodating and the staff, as well. This cheese shop has personality, and that’s what will keep customers coming back. 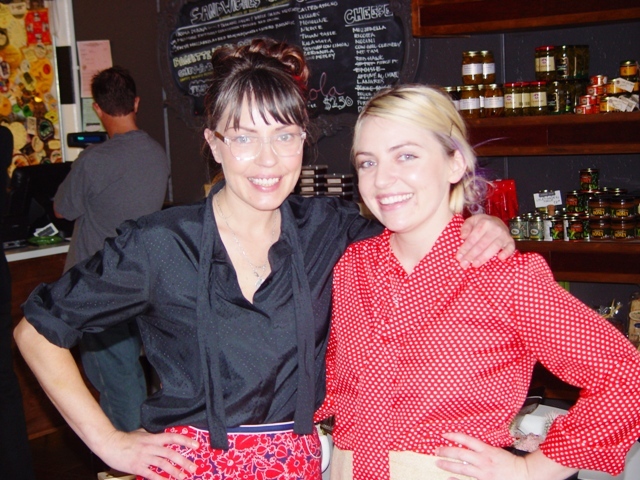 The cheese girls take the romance of cheese to a new and fun level that is worth exploring. The Cheese Cave is located at 325 N. Yale in Claremont. Hours are 11 a.m. to 7 p.m. Tuesday through Thursday; Friday, 11 a.m. to 7 p.m.; Saturday, 10 a.m. to 6 p.m.; and Sunday, 10 a.m. to 3 p.m. The shop is closed on Mondays. The phone number is (909) 625-7560. Not a free subscriber to LaVerneOnline.com yet? Are you kidding me. Like good wine and cheese, there’s no subsitute for a great online newspaper. Once a week, receive the free Online Update from Publisher Pete. Just go to the home page and click on the FREE SUBSCRIBE tab. Also for great real estate information, try Colleen Bennett with Keller Williams. Her service and care for her clients is another great treat worth exploring. Her phone number is (909) 374-4744.